Beach entrance to Norton Point "looks like a bomb went off," Trustees superintendent Chris Kennedy said. 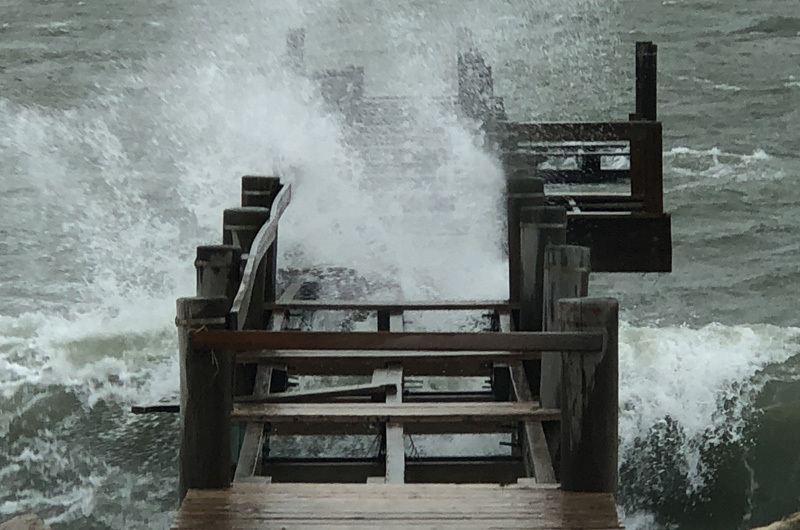 A powerful winter northeaster that pounded the Island late last week with hurricane-force winds, astronomical high tides and heavy rains left town and beach managers scrambling to assess damage and begin repairs. No known injuries were reported from the storm, but many areas saw heavy property damage from winds and flooding, especially in coastal and low-lying places. “This is the worst storm that I have seen,” Tisbury harbor master John Crocker told the Gazette Monday morning. “I have never seen tides this high before. It was just incredible,” Aquinnah town administrator Jeffrey Madison said. The severe northeaster wreaked havoc all along the Massachusetts coastline. Many areas on the mainland were without power through the week and Gov. Charlie Baker declared a state of emergency throughout the commonwealth. A second storm on Wednesday brought more snow, wind and damage across the state, although on the Island it was only a glancing blow with gale-force winds and rain that moved out by the next morning. The first storm raked the Island throughout the day and night on Friday, lasting through three high tides, cancelling ferries and forcing the closure of many coastal roads. Trees were down everywhere, sailboats broke free of their moorings and docks took a beating. The Martha’s Vineyard Shipyard on Beach Road in Vineyard Haven clocked sustained wind speeds of 70 miles per hour and a peak gust of 81 miles per hour, owner Phil Hale told the Gazette Monday. Some areas fared better than others. 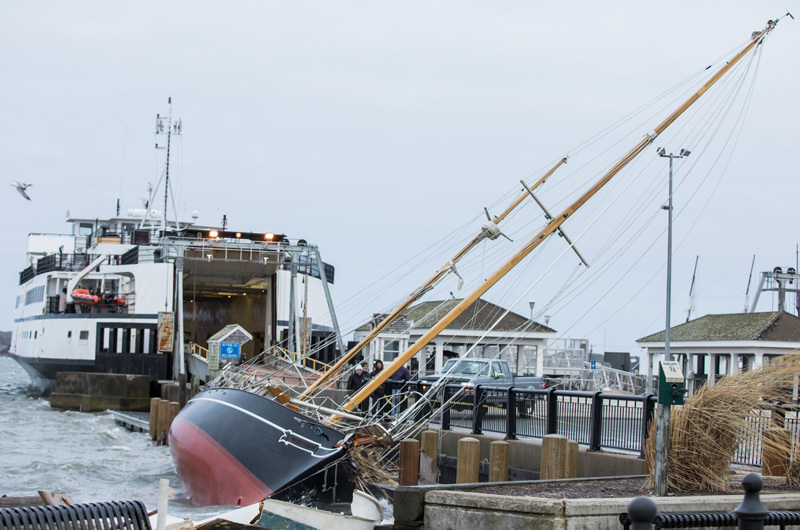 Mr. Crocker said the Vineyard Haven harbor sustained significant damage. He said the south side of the T on the Owen park pier has collapsed and will require significant repairs. During the storm, four large sailboats broke loose from their moorings. Three landed on the beach without damage. The other was pinned against the Steamship Authority’s dinghy dock. Mr. Crocker said he was concerned about the entrance to Lake Tashmoo filling in, but conditions were such that he wouldn’t be able to assess the depth until there is a break in the weather. Selectmen agreed and said they plan to evaluate the situation. On Chappaquiddick, Mr. Kennedy of the Trustees said the bridge at Mytoi garden was damaged by a falling tree, and part of the Dike bridge gate house had blown over and was blocking the roadway. “The entrance to Norton Point looks like a bomb went off,” Mr. Kennedy said, adding that the access road and gate house would have to be relocated. 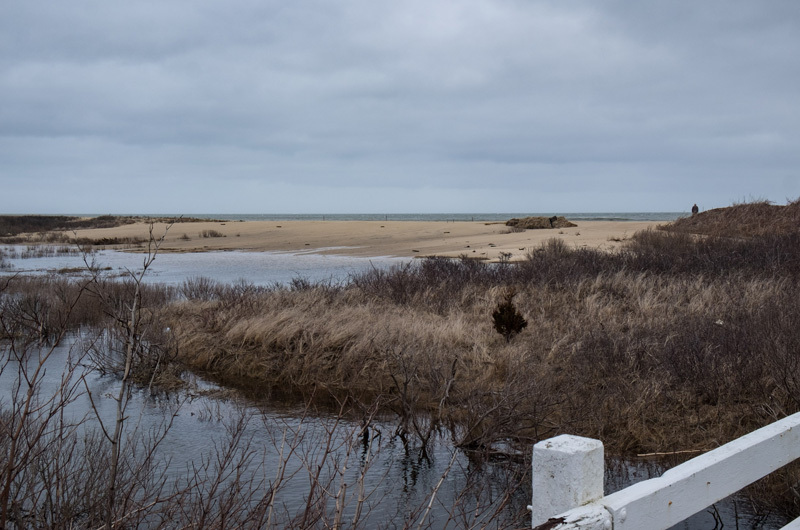 He reported extensive flooding at Long Point Wildlife Refuge in West Tisbury, and the loss of the new dune that the Army Corps of Engineers recently constructed. All Trustees beaches were closed to vehicle access this week. He said he had been unable to assess the damage at Cape Pogue because the sandy roadways were still under water. Aerial pictures of the elbow taken by Bill Brine were posted on Facebook during the week. At a meeting of the Edgartown selectmen Monday Edgartown harbor master Charlie Blair said the harbor fared relatively well. “We have a well set up harbor for northeast winds,” he said. One large sailboat dragged its mooring down harbor. Mr. Blair said the main damage was at the Eel Pond boat launch, where the ramp was completely washed out. Fire chief Alex Schaeffer said the fire department received 15 calls from 4 p.m. Friday to 8 a.m. Saturday for situations ranging to pumping out flooded basements to a problem with sprinkler system at town hall. The main event was downed power lines Friday night that started an electrical fire next to the Edgartown Mobil station. “That was a pretty spectacular event,” Chief Schaeffer said. At the Edgartown Great Pond, by week’s end the pond was opened to the sea to help release the extreme high water. Shellfish constable Paul Bagnall said the cut may only be temporary. 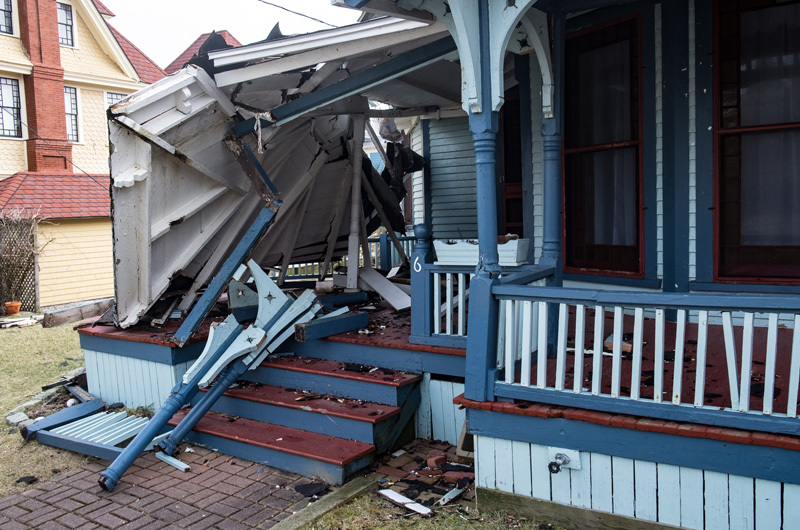 In Oak Bluffs, police were kept busy with road closures at the height of the storm, but later it appeared that damage was scattered but minimal. “It seems like we fared better than some of the other towns,” said harbor master Todd Alexander. “The wind was a touch north of northeast, that makes a big difference in here.” He reported minor erosion under the docks near the ferry Patriot. And he echoed others on the ferocity of the storm. “I’ve never really seen it like that in my 25 years,” the harbor master said. The extent of damage at the East Chop Bluff, already damaged by an earlier storm, was not immediately known, but town engineers were expected to make a report next week. At the Youth Tennis Center off Barnes Road the winter bubble that allows for indoor play was left in ruins after a backup generator failed during a power outage in the storm. Mr. Scott estimates that 160 students are enrolled in the current session, ranging from first grade to high school age. This session was the last before the bubble would typically be deflated and lessons moved outside in late April. The students didn’t have to wait long to find a replacement facility, thanks to Connie McHugh and Airport Fitness & Tennis. Vineyard Youth Tennis is now on contract with Airport Fitness to allow Youth Tennis sessions to continue at their indoor tennis courts until the end of the winter session. “The program was only off for one day while we made arrangements to move,” said Mr. Scott. “We’re very grateful [to Ms. McHugh],” he said. In Aquinnah, roads were littered with debris and on Monday morning police chief Randhi Belain said he was still waiting for state highway crews to come assist with cleanup. A large tree came down on State Road near the Orange Peel Bakery, and Lobsterville Road was covered with sand, the chief said. In Chilmark minor dock damage was reported in Menemsha, and at Squibnocket Beach the old roadway was left in pieces. “For as significant as the storm was . . . it could have been worse,” said Chilmark police chief Jonathan Klaren. In West Tisbury, police Lieut. Matt Mincone said aside from many downed trees, the town sustained little damage. “I know different places on the Island had it differently, but certainly we made it through okay,” he said. Town administrator Jennifer Rand concurred. “We were very lucky,” she said. Sara Brown, Steve Myrick, Landry Harlan, Holly Pretsky and Mark Alan Lovewell contributed reporting. John Crocker wasn't even here for the storm! Now seems to be reveling in the attention. And the lack of effort by the Harbormaster to make a safe harbor will be an upcoming discussion! Makes sense to take a boat in with a storm coming and not blame the harbor master. How did Herring Creek Farm make out? Did it flood? Any damage to the homes? Thank you, VG, for not succumbing to the usage of that ridiculous non-word that has taken over as the moniker of the northeaster. Henry Beetle Hough would be proud. There is no R in no'theastah! Stay safe out there, sending love from the mainland.